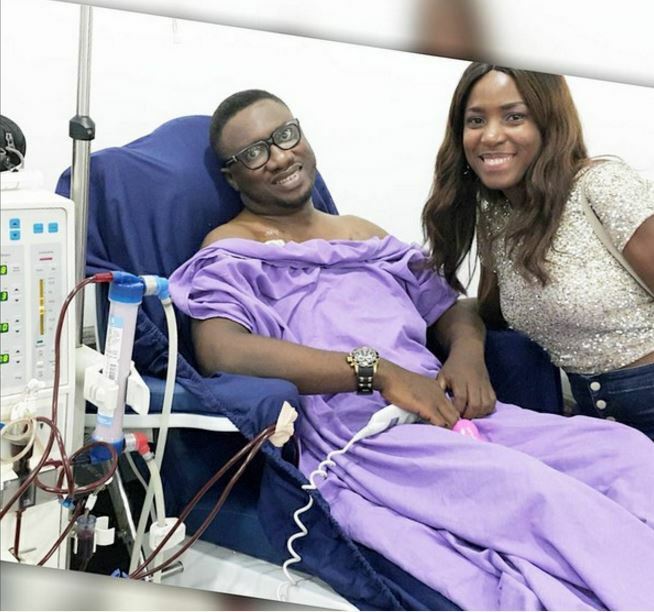 Good friends who will standby you (both in good times and bad times) are hard to come these days -especially those with fame and fortune…so when one is spotted, he/she should be appreciated…Veteran broadcaster and ‘king of talk shows’, Emma Ugolee who is suffering from failure -has only words of love for popular blogger Linda Ikeji who once again proved her longstanding friendship to him yesterday..
Had been on the phone earlier today with ma sister right here who was not too happy with how I sounded. True to her worries, I was rushed to the hospital on an emergency tip this afternoon. Calling to find out if it felt any better and realizing I had to dialyse, she froze work, ran to the hospital and literally stood on her feet next to my bed till I was smiling. She left the hospital this late after having amazing material impact on dialysing patients and watching me walk to my car.. So going home now am thinking. This woman has been unshaken as a friend for 16years and in the last 5years of the struggle to stay alive with Kidney failure every time a hand is squeezing mine to say we would beat this in the darkest times, it his hers. No fatigue with the love shown, no trumpet blowing, an amazing friend as would be readily testified by those that know her at the same time when I can write 10 books on fair weather friends whose level of worry would start and culminate in a 48 hour use of my face for a dp if God permitted it to go south. ……. and you want to ask why I am shouting her name at the risk of sore lungs? I love you Linda Ifeoma Ikeji. God bless you for being a TRUE friend.